After the cookie/carmel combo success with the Coconut Thumbprint Cookies I decided to try these delicious Chocolate Caramel Cookie Bars. 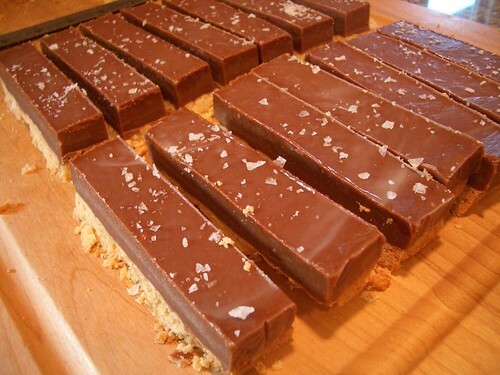 These bars are reminiscent of a Twix candy bar with a buttery cookie base covered in a decadent chocolate caramel topped with a light dusting of sea salt. These homemade candy bars are a terrific treat and make great gifts! The homemade caramel is mixed with creamy milk chocolate and poured over the buttery, crunchy cookie crust. After the caramel sets up it gets a light dusting of Maldon Sea Salt and is then cut into long bars just like your favorite candy bar! Crunchy, buttery, caramel and chocolatey: can’t miss goodness. Here is how you can make your own. You can find the basic recipe here. I followed this recipe with a few changes: I added 1/4 cup corn syrup to the caramel to keep it from crystalizing. You certainly don’t have to add the corn syrup I have just found that it really helps create a smooth, grit-free caramel. I also cooked my caramel mixture longer than the instructions called for. I cooked the initial carmel until it registered 248 on a digital thermometer and after I added the butter and cream I brought the temperature back up to around 235 degrees to ensure that the chocolate-caramel topping was firm enough to cut but not chewy like a regular caramel candy. Preheat oven to 350 degrees. Line a 9″ x 9″ baking pan with parchment or aluminum foil. Make sure to leave an overhang on two sides for easy removal. I used aluminum foil and sprayed with Pam. Set pan aside. Crust: In the bowl of an electric mixer fitted with the paddle attachment beat the butter and brown sugar until pale and fluffy. I added a 1/2 tsp. of vanilla extract to the dough for extra flavor. Add the flour and table salt and beat until just combined. Dough will be crumbly. Press dough evenly into the bottom of the prepared pan. I used a spatula to press the dough down into the corners evenly. Bake the crust for 30 minutes until lightly browned. Set baked crust aside. Chocolate Carmel: Place chocolate in medium bowl and set aside. Heat sugar, water (and 1/4 cup corn syrup if using) over medium high heat until golden color. I cooked my caramel to 248 degrees on a digital thermometer. Carefully add butter, cream and salt and stir into sugar mixture until smooth. Keep cooking until the mixture reaches a boil. I continued to cook my caramel to 235 degrees on a digital thermometer. Pour hot caramel over the chocolate. Let sit for two minutes then stir until smooth and well combined. Let mixture cool for 10 minutes. Pour cooled chocolate caramel over the cookie crust and smooth evenly. Refrigerate for 4 hours or overnight (I chilled mine overnight). Remove parchment or aluminum foil from candy and sprinkle with Maldon Sea Salt. Cut into squares or bars with a sharp knife that has been run under hot water. Clean knife repeatedly for each cut. Store bars in airtight container.